The Solemn Compact: Why We Need the Electoral College. With the recent 2016 Presidential election, there's been a great deal of debate about whether or not the Electoral College is necessary for our country, or if its an antiquated political mechanism that should be abolished. Only five candidates in history have won the Presidency despite losing the overall popular vote: John Quincy Adams in 1824, Rutherford B. Hayes in 1876, Benjamin Harrison in 1888, George W. Bush in 2000, and Donald Trump in 2016. Trump won the election despite losing the popular vote by approximately 2 to 3 million votes (not taking into consideration accounting errors or potential fraud). Is it fair for a candidate to become President without winning the popular vote? I answer with a resounding yes! Here's why. The Electoral College was purposefully designed by the Founding Fathers to decentralize power between the states and to lessen the likelihood that a rampant bout of corruption in any one specific state could taint the overall election. As such, we the voters indirectly cast our ballots for President when we visit the voting booth. When we vote for a particular candidate, what we're actually voting for are state electors whom promise to vote for the candidate chosen by their fellow residents. For example, the state of Wisconsin is currently allotted 10 Presidential electors. In the 2016 election, the voters of Wisconsin went for Donald Trump. Accordingly, the 10 selected Presidential electors of Wisconsin followed the will of the state's residents and directly cast their elector votes for Trump. Because she did not win the popular vote in Wisconsin, Hillary Clinton was awarded zero votes. To win a Presidential election, a candidate has to garner the majority of all available Electoral College votes. Currently, that majority is 270 out of a total 538. Each state awards a different number of Electoral College votes, depending upon the population size of the respective state. California, with approximately 40 million residents, awards 55 electoral votes. New Hampshire has 1.3 million residents and awards 4 votes. Alabama has 4.8 million residents and awards 9 electoral votes. As you can see, each state is different when it comes to their overall relevance to the outcome of the Presidential election. More populous states like California are very important to the eventual outcome. Less populous states like New Hampshire are not as important. States like Alabama with moderately-sized populations are somewhat important. By creating the Electoral College, the Founders foresaw the power that more populous states would enjoy during elections and established a barrier to such unfairness. Were the President to be elected directly by popular vote, states with smaller populations would be outright ignored by the candidates. Why? Because the larger states would have far more voters. Their wants and needs would be more readily addressed by the potential candidates. States with smaller populations would be avoided altogether; their needs would be wholly disregarded. Under a direct popular vote system, large urban centers like New York City, Philadelphia, Chicago, Seattle, Dallas, Denver, and Los Angeles would ultimately dictate policy to the rest of the entire country. Despite their being different governmental needs between those living in urban and rural settings, those living in large urban areas would have all the say in who was elected President. Farmers in Iowa would be ignored. Real estate agents in Delaware would not be heard. Waitresses in Idaho would be all but forgotten. 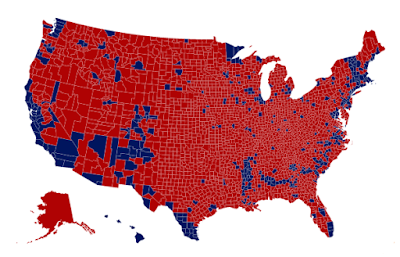 The image above shows the breakdown by county of the 2016 Presidential election results. As visible, the number of counties in red that voted for Donald Trump far outweigh the number of counties in blue that voted for Hillary Clinton. This directly illustrates why the Electoral College is still necessary. Without it, the very select high-population areas in blue (cities like LA, New York, and Philadelphia) would dictate how the government operates for the entire rest of the country (often referred to as fly-over country). Remember, our republic is a union of States, not just people. Think of your own state as like a mini-country (which it earnestly is in the eyes of the Founding Fathers). The Electoral College is absolutely necessary to the liberty of our nation, and will continue to be so for as long as we're privileged enough to grace this planet.